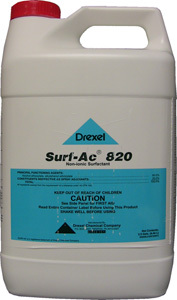 Surfactant/Crop Oil- Surf-Ac 820 can be used with those insecticides,fungicides, herbicides, acaricides, defoliants, desiccants and wettable powders that recommend the addition of a non-iconic surfactant with a load of 80% or higher. Contains anti-foaming agents to speed load time. Active ingredient: 80.0% alcohol ethoxylate, alkylphenol ethoxylate.